Distressed denim, whereby jeans have a worn look, might be fashionable, but the traditional techniques to produce such an effect, like sandblasting, manual scrapping, or applying potassium permanganate, can be incredibly harmful to factory workers manufacturing the jeans – blasting denim with sand, for instance, has been linked to lung disease in workers. Laser processing has been shown to be a viable alternative to sandblasting to give denim the appearance of being worn. Valencia-based firm Jeanologia has supplied more than 1,000 laser systems for marking jeans for renowned brands such as Levi’s, Polo Jeans, Abercrombie and Fitch, Edwin Japan, Pepe Jeans, Diesel, Hilfiger Denim, Calvin Klein, and other large retailers such as Gap, Uniqlo and H&M. Now a multinational company, Jeanologia designs and develops laser systems that enhance industrial productivity, improve energy efficiency, and eliminate waste. In particular, the firm focuses on providing laser technology for the jeans garment finishing industry. ‘Thanks to lasers, it is possible to achieve – in a sustainable and efficient way – endless designs, vintage looks, precise breaks, total prints, [and different] textures,’ explained Jeanologia’s marketing manager Carmen Silla. Jeanologia offers its Flexi HS3D laser for garment finishing. It uses a CO2 slab laser and features a scan head from Scanlab. Jeanologia also supplies its eMark software to program the laser system, within which it is possible to combine designs, apply filters and textures, and experiment with different brightness to get an authentic and 3D look in the final product. 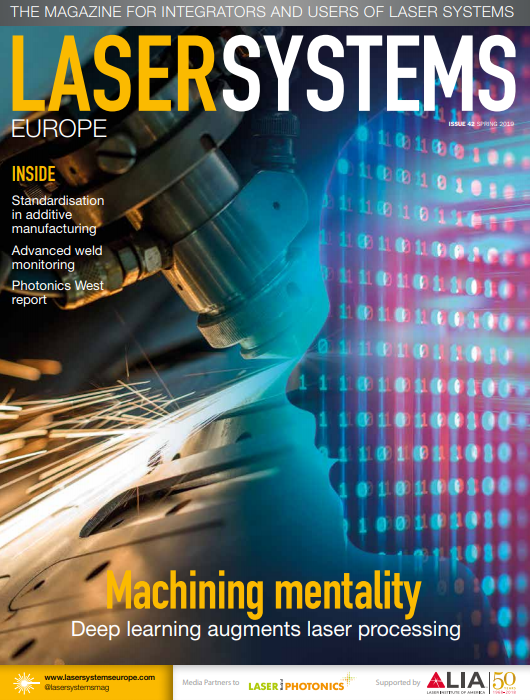 Laser technology offers opportunities for scaling production. ‘We can test different designs, make the final samples, and get all parameters turned into bulk production,’ added Silla. This ability considerably reduces the time and cost of going from market to production. Laser cutting can offer considerable advantages over traditional textile and fabric processing techniques that use cutting dies or punching tools. CO2 lasers – 10µm-wavelength radiation from CO2 lasers is absorbed by organic materials better than the shorter 1µm wavelengths of fibre lasers – have been increasingly employed for trimming fabrics, and when teamed with a scanner, allow for flexible changes at minimal cost. To users, that’s a huge advantage for creating complex shapes or patterns, as well as for producing individual products and generating small production runs. Some designers seek out artistic patterns, while other manufacturers will use laser perforation to create breathable membranes. Different technologies are available to achieve these features, from laser cutters suitable for an artist’s studio, to high performance laser systems. Artist Amy Karle uses Colorado-based Epilog Laser’s tools to turn drawings into laser cut fabric for custom-fit garments and fine art. Starting with a hand drawing, she scans the image at 300dpi or higher. She then cuts the design into layers of silk, cotton, and synthetic, scaled to fit the laser cutter’s digital environment. Her art is inspired by human internal organs, and an intricate dress modelled on lung vasculature showcases the detailed feather-like designs that she cuts by laser. Epilog Laser offers affordable and easy-to-use laser engraving and cutting systems that have found their way into many fashion and art applications. The company’s Legend, Zing, and Fusion models incorporate a 30-120W, air-cooled CO2 laser into a desktop machine. A client can scan the desired image and quickly set up a custom, one-time engraving, ‘just like printing on paper’, said James Stanaway, director of marketing for Epilog. ‘One thing we’re proud of is how easy our [laser] is to use. You’re not learning custom software; you can print with whatever software you’re already using. You create the graphic quickly and send it right to the laser,’ he added. It’s simple to adjust speed and power settings for different kinds of textiles – for example, a fleece requires higher power because there’s more material, while removing dye from cotton requires less power. Synrad, in Mukilteo, Washington, develops laser sources for high-throughput industrial applications. Customers requesting solutions that did not yet exist led the company into new niches of fabric processing. ‘For textiles, and in particular the high-performance sportswear markets, there’s been a trend in getting away from traditional methods and looking at laser cutting,’ observed Justin Conroy, applications engineering manager at Synrad. 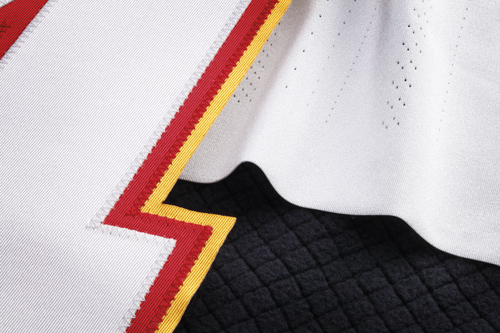 With lasers, holes can be strategically placed in polyester and lycra sportswear for ventilation or aesthetic embellishment; the designs can easily be altered with software for on-the-fly processing. ‘We’re competing against old-school mechanical techniques,’ Conroy added. One disadvantage for mechanical techniques is that cutting certain types of fabric can result in frayed edges and loose threads. Laser cutting naturally seals the edge. For best throughput, the laser energy needs to be absorbed efficiently by the material. While synthetic fabrics absorb the long wavelength (typically 10.6µm, but 9.3µm for polyester and lycra) produced by CO2 lasers, using a pulsed laser can further improve throughput. Pulsed lasers deliver short pulses with high peak power, reducing the heat affected zone and fabric roughness, while allowing faster scan speeds. Lower power lasers are suited for marking and engraving, while systems above 100W are suited to cutting. A recent test compared Synrad’s continuous wave i401 series (400W) and pulsed Pulstar p250 (250W) lasers, using a galvo scanning head for high-speed processing, to illustrate the advantage of a pulsed laser for perforating high-performance polyester, spandex, and nylon materials. While the resulting perforations had similar quality, the pulsed laser offered a 1.5-times increase in throughput. MCT Digital’s Versa-Tech machine incorporates Synrad’s ti100 series lasers to cut large areas of textiles, made possible by mounting the laser vertically on a moving gantry. Until recently, it was impossible to do this type of moving setup on a small gantry with a high power laser, because the RF driver was housed in a separate large, bulky module. However, with modern, compact RF driver designs integrated in the same housing as the laser tube, there’s a lot more flexibility to place the laser on the gantry. This simplifies beam delivery for large-field cutting, which otherwise would require a complicated flying optical setup, and the accompanying challenges for alignment and collimation. Looking forward, Conroy expects to see more detailed onboard diagnostic tools on lasers; the more information that the laser can provide about how ‘healthy’ it is, the better it is for predicting maintenance and upkeep. This data-driven future will further improve automation and processing speeds for the textile industry and elsewhere. As in many other industries, the textile industry seeks shorter throughput times, increased production output, and reduced costs. Scan systems for positioning laser beams contribute to meeting these demands, as they make possible the high processing speeds and flexible adoption of laser technologies. Scanlab, which makes laser scanning solutions, offers various systems suitable for the textile industry. The PowerScan II is a new 3D scanning device for industrial cutting with multi-kilowatt CO2 lasers. Its low-mass 50mm mirrors enable small spots combined with high dynamic performance. Thanks to the integrated Flex functionality, the image field size is adjustable to suit a broad range of applications, thus making the scan head particularly compelling for processing textiles. Other 2D scan systems like the IntelliScan can be extended to a 3D system in combination with a VarioScanFlex, which provides a motorised focus optic to enable step-less varying of image size, working distance, and spot size. Specific requirements of the textile industry have influenced the engineering focus of Scanlab. For example, the new housings of the PowerScan II are sealed and dust-protected. Furthermore, the beam exit port is equipped with an exchangeable window for protection against process emissions, to guarantee compliance with textile industry regulations. In many cases, higher processing speeds require higher laser powers. From the perspective of the optics, this involves larger lenses and mirrors to manage thermal effects. Larger optics also allow for smaller laser beam spots at higher working distances. High working distances, in turn, give access to larger samples that can be processed in one run. ‘We have seen this trend with several customers moving from systems with 30mm aperture towards 50mm or even 70mm optics,’ commented Uwe Megerle, Scanlab product manager. Applications using Scanlab systems range from patterning textiles, such as stonewashed jeans, to cutting materials that will be attached to garments, and cutting technical textiles like airbags. The shoe and leather industry, too, uses laser scan systems not only to cut the leather soles, but also to engrave and shape the upper leather parts of a shoe. These systems mean the leather can be cut and patterned in a single step, while also offering a cost-effective means to make small production lots of different shoe sizes without changing tools.